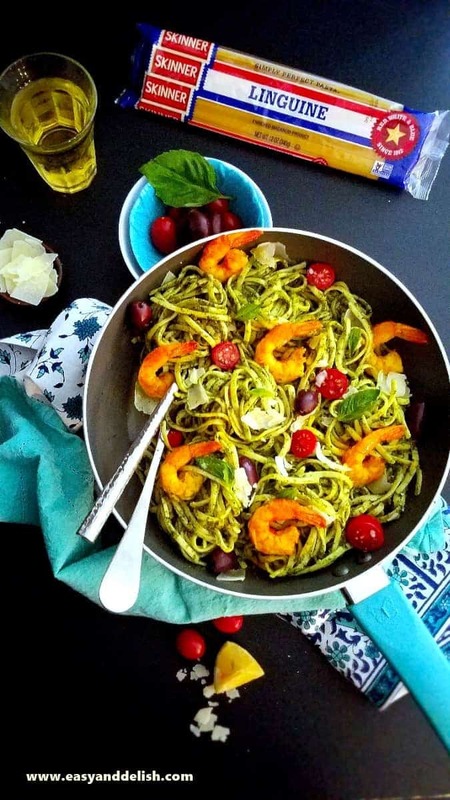 Kale Pesto Pasta is a quick and easy weeknight meal that also has Parmesan cheese, tomatoes, olives, and shrimp (or any other protein of your choice). Disclosure: This is a sponsored post written by me on behalf of Skinner® Pasta. Thank you, friends, for supporting all the brands that I work with and love. It’s the early part of the school year… and we’ve got you covered! This Kale Pesto Pasta makes the most delicious and comforting meal for both kids and parents. And you know what? It can be prepared in 30 minutes. It is already in the list of family faves! 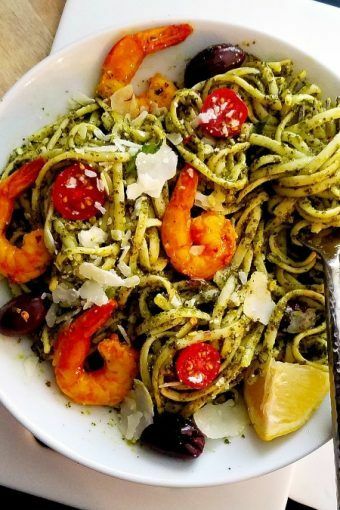 Our Kale Pesto Pasta is nutritious, yet prepared with simple ingredients: budget-friendly Skinner® Pasta, kale pesto, shaved Parmesan cheese, grape tomatoes, black olives, and any protein of your choice, such as shrimp. All we have to do is to cook the Skinner pasta (in this case, linguine) according to the instructions on the package. Then, drain and mix with a homemade kale pesto. 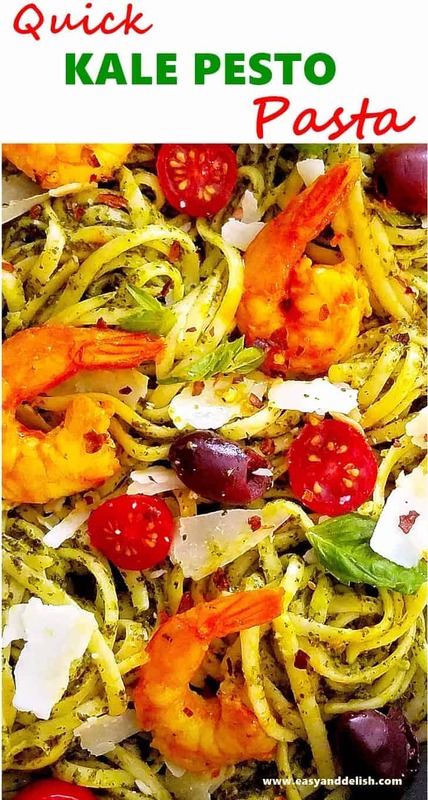 Right before serving, add shaved Parmesan cheese, grape tomatoes, Kalamata olives and, if desired, cooked shrimp or another protein of your choice. Voila! — before you know it, a complete dish is ready for your lunch or dinner, helping make those busy early-school-year schedules manageable enough that you can enjoy more family moments together. The homemade kale pesto can be prepared in the blink of an eye and requires no cooking. Thawed chopped kale, fresh basil, olive oil, salt, pepper, garlic, lemon juice, and Parmesan cheese are blended together in a blender or processed in a food processor until mixture is smooth. See? Easy peasy! I am telling you, this pasta dish will put a smile on your face. It tastes amazing! Also, it is accessible, friendly and uncomplicated… just like the people of Texas, my home state. Skinner pasta is the #1 pasta in Texas. 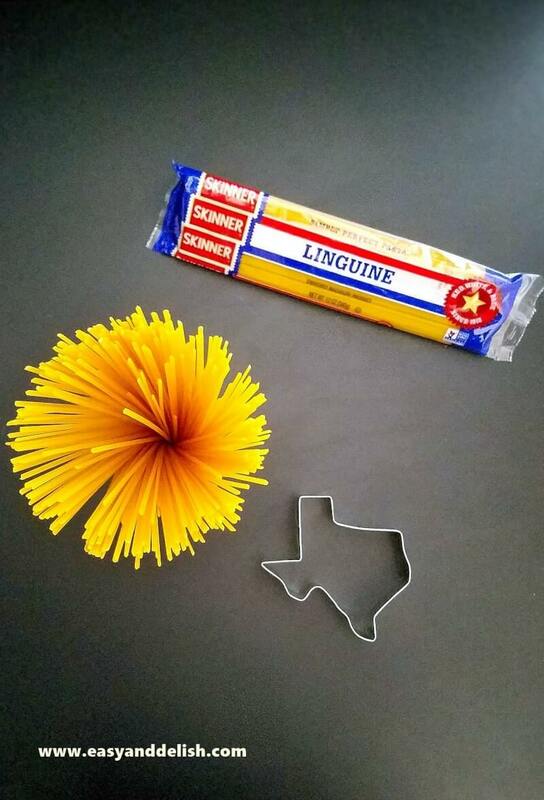 In addition, it is enriched, easy to cook, and features a variety of pastas such as linguine, spaghetti, penne, fettuccine, elbows, and even a fun Texas shape. This makes Skinner perfect for both weeknight meals and dishes for special occasions. 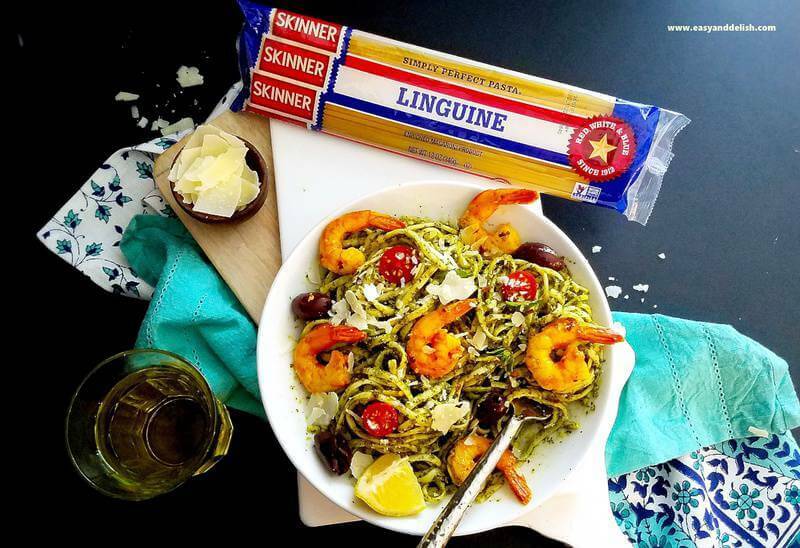 For more information about Skinner products and other easy delicious recipe ideas like this Kale Pesto Pasta, please visit skinnerpasta.com . Quick and easy meals are an effective tool often used for saving time at my household. And how about yours? I would love to hear how your family manages a busy school-year schedule! 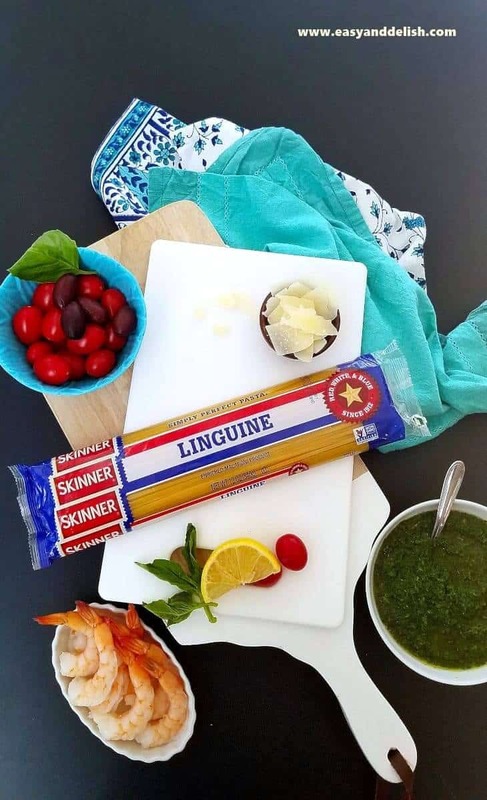 In addition, what other dish(es) would you like to prepare with Skinner pasta? I am looking forward to hearing your ideas. For now, enjoy your family and a great meal together! 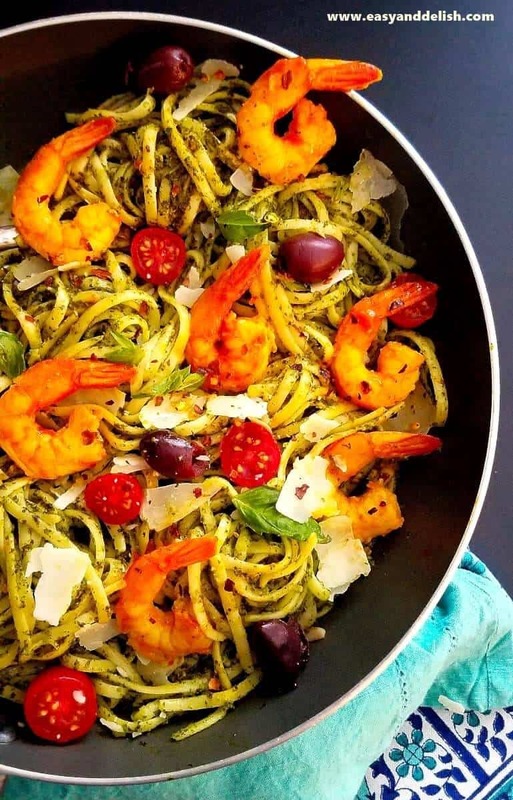 Kale Pesto Pasta is a quick and easy weeknight meal that also features Parmesan cheese, tomatoes, olives, and shrimp (or any other protein of your choice). Cook the pasta according to package directions. Meanwhile, prepare the kale pesto. In a blender or food processor, combine the kale, basil, salt and pepper. With the motor running, drizzle in the olive oil. Then, turn it off to scrape down the sides of the blender or processor. Add the garlic, lemon juice, and Parmesan cheese and blend/process well until mixture is smooth. Set aside. Once pasta is cooked, drain and add the cooked shrimp or other protein of your choice. Toss with kale pesto and top with Parmesan cheese shavings, grape tomatoes and Kalamata olives. Garnish with lemon slices or wedges if desired. Serve while it is hot, and enjoy! Pasta!! I love pasta but I cant say the same for kales. I hope this kale pesto pasta is my hope to eat kale. Haha. I will try it very soon! Thank you for sharing this great recipe, Denise. Hi, Susie! I see. My 11-and-9-year-old kids hate kale. But I served them this pasta without them know that contains kale. They ate and love it! Just then, I told them that had kale. The good thing about this kale pesto is also has fresh basil which makes the the taste of kale quite subtle. It is indeed a great way to get all the kale vitamins without its odd taste. I hope you make it and enjoy. Love this easy shrimp dinner! I no longer have school aged children, but my life savers were, crock pot dinners and freezer dinners. When I cooked I made big batches, freezing some for another dinner. Weekend vegetable prep helped keep my sanity too. They grow up so fast, enjoy! I can certainly understand. 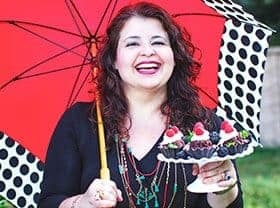 I am a busy mom of two and cooking nutritious yet easy and quick dishes help me tremendously to manage my schedule. Enjoy! Oooh, what a gorgeous pasta dish! This may be the only way I’ll ever get Bill to eat kale, but I have a feeling he’ll love it as much as I will. It’s been way too long since I’ve stopped by—love how you rebranded your blog!!! Thank you, Liz!!! It is so good to have you here visiting us again. I hope you have the chance to make this pasta for your husband… and enjoy! 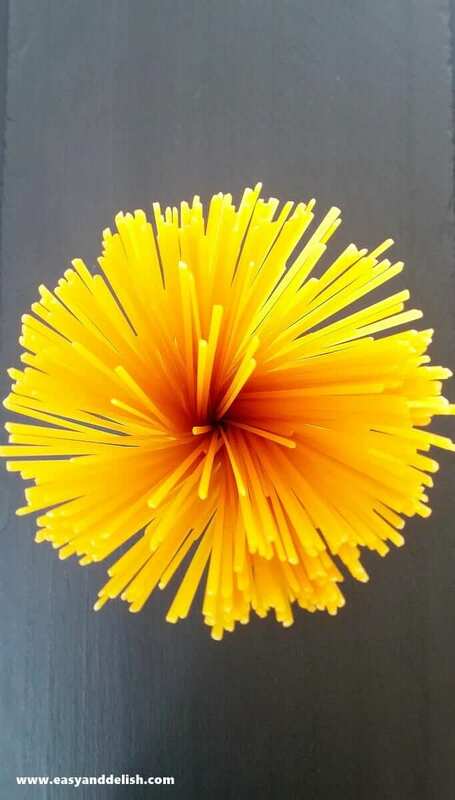 I don’t know if it’s the same with you and your family, but here, if it’s pasta, they will like it. I must try the kale in this way. It looks so yummy! I have never tried kale pesto pasta, but love the flavor combination , I will make it soon for my family! Hi, Brenda! It is so good to have you here visiting my blog. I hope you try this recipe. I made for the first time and even my kids that hate kale, love this pasta. The taste of kale is quite mild because the pesto also has basil. Have an amazing weekend! Love when you combine available ingredients to make such a beauty ! Thank you ! Enjoy this dish and the season! Thank you so much! It is a nutritious dish yet quite delicious. Something out of the ordinary! A simple but nutritous and very elegant meal. I can’t wait to give this a go. Nothing can beat fresh pesto sauce and pasta for an easy, yet satisfying meal. And this is a recipe I love to recommend. Thank you! My children are quite picky and they hate kale but the taste was so mild in this pesto that they ate and loved it without knowing there was klae in the pesto sauce.